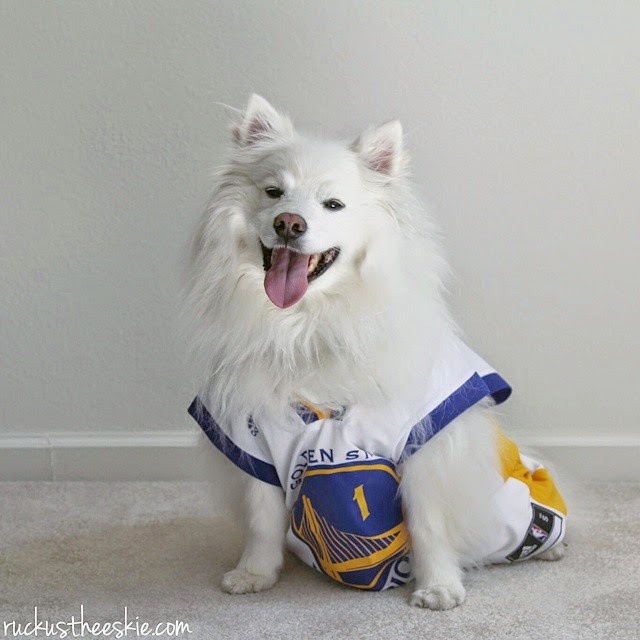 Ruckus the Eskie: Thoughtless Thursday #72: Can't Get Enough of the Dubs?? Thoughtless Thursday #72: Can't Get Enough of the Dubs?? Game 1 tonight against Lebron! Got to keep the mo' going! Let's go Warriors! haha PLUS you look mighty fine while cheering them on! Wow, trying to enter a blog hop today is not fun! Posting a picture in Linky isn't working for us on any blog, so we're wondering if it's the latest Firefox update causing the problem. We did finally figure out how to get around it, though. Have a great blog hop. That's team spirit right there! Aww, Ruckus looks so proud!